The symposium venue is Kumamoto University Kurokami South Campus, which is about 30 min. taking a bus from JR Kumamoto Station. Route map is available from here. Click here for detail information about Kurokami South Campus. The illustrated maps are linked here. Google map is linked here. The following ways are available for access to the campus. 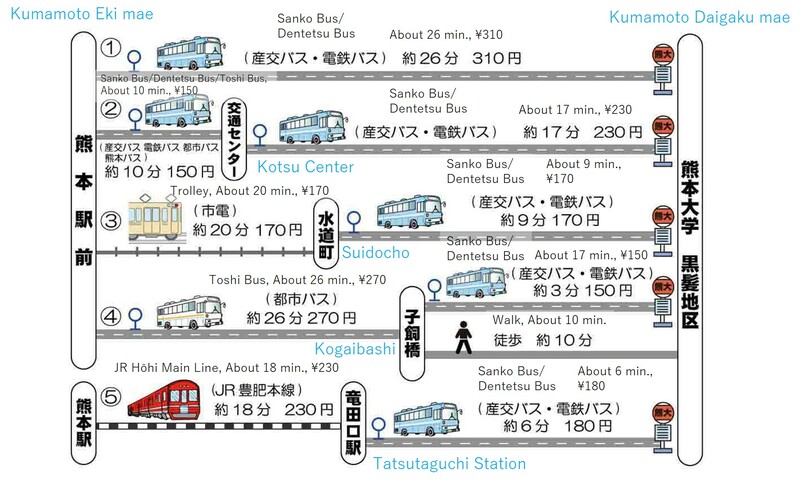 From KUMAMOTO Airpot (50 minutes): Take Airport limousine to Kumamoto station（熊本駅）, and switich to Sanko bus（産交バス）from Suidocho（水道町）to Kumamoto daigaku mae （熊本大学前）. Registration Desk is on the 1st floor of Kurokami South C8 (Engineering Lecture Hall). Venue map is linked here. The ISCS organizing committee does not offer any hotel room at a discounted rate. The attendees are advised to book a hotel on their own using any commercial hotel booking website. There are number of hotels in nearby Kumamoto station.